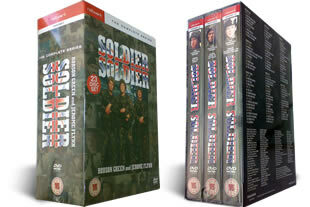 Soldier Soldier DVD Complete Collection 23 DVD Box Set. Inc FREE UK DELIVERY Follow the trials and tribulations of the soldiers of The King's Own Fusiliers over the complete series 1-7 of the critically-acclaimed and successful SOLDIER, SOLDIER. 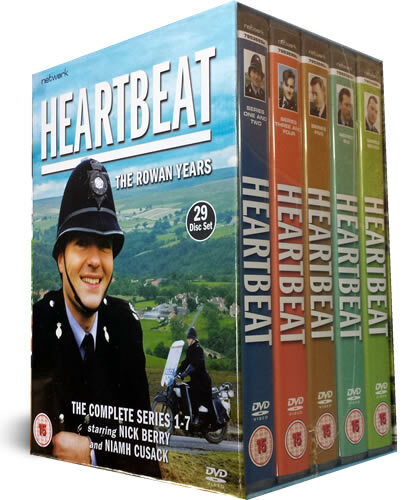 This 23 DVD series was filmed all over the globe and made stars of its two leading men - Robson Green and Jerome Flynn. Region 2 - Will only play on European Region 2 or multi-region DVD players. Great series. Provides a realistic insight into the British at this time. Havn't watched the DVD's yet but loved the series so much. Missed a few episodes so got the set so that I can watch at my leisure! Soldier soldier was classic tv with great characters & ones you could believe in. Robson Green, Jerome Flynn & Rosie Rowell made it for me-buy it, it's a great price. Loving watching this series again after all these years. I loved Soldier Soldier back in the 90's and to watch Robson Green and Jerome Flynn again in this is brilliant. I already had some soldier soldier dvd sets of the individual series, but at this price it worked out cheaper to buy this whole collection rather than the other series I needed. Great product and fast delivery, very pleased. Prompt, personal service and well packaged. A real blast down memory lane. Loads of space on the shelf, as now we can get rid of a huge pile of VHS tapes! THE DVD ARE GREAT AND PACKED WELL AND ARRIVED IN SHORT TIME.